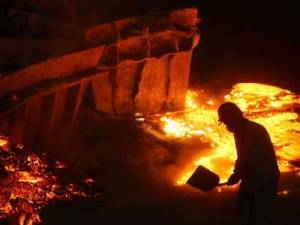 [miningmx.com] – ASSOCIATED Manganese (Assmang), jointly owned by African Rainbow Minerals (ARM) and Assore, has decided to shut down the last operating furnace at its Machadodorp ferroalloy smelter by the end of April. Two of the three smelters at the Machadodorp complex had already been closed. The decision to close the last, first reported by the Metal Bulletin, was confirmed to Miningmx by Jan Steenkamp, CEO of strategic services and exploration. Steenkamp said a Section 189 process was underway at the plant where it was hoped that the metals recovery plant, which recovers metal from old slag material, could be kept in operation. “That may be able to stand on its own feet but no decision on its future has been taken yet,’ he said. Closure of the last furnace follows comments by ARM CEO, Mike Schmidt, in his presentation to the Mining Indaba on February 4 that the group’s smelter operations were being reviewed as part of a programme to deal with the current slump in the commodity cycle. The decision to shut the smelter was taken because of the depressed market conditions for ferro-manganese and rising costs, in particular electricity of which smelters are heavy users. Steenkamp said the decision to close had been taken ahead of the disclosure in the 2015 Budget on February 25 that intensive electricity users were to be hit by a temporary increase in the electricity levy which would further increase costs at Machadodorp. But he added the imposition of the levy further underlined the attractiveness of Assmang’s new Sakura Ferroalloys plant being built in Sarawak, Malaysia where a 15 year power purchase agreement had been signed to provide “reasonably-priced hydro-electric power’ with an annual escalation clause of just 1.5%. Assmang is the majority shareholder in Sakura where the first smelter is due to start operating at the end of October this year and the second to be up and running by April 2016.